Magda Dygała (pictured with some of her students) is a teacher trainer at the University of Technology and Humanities in Radom, Poland. She’s also an English teacher at the ZSO 7 Secondary School. Following her popular ETpedia blog post on using songs and music in the classroom, in this new post Magda shares more of her ideas on teaching vocabulary. There’s a danger that learning long lists of new words can sometimes be boring for students but by adding fun and interesting ways to teach new words, teachers can make the process more entertaining. Below are 10 techniques teachers can consider when teaching vocabulary. Distribute some handouts to students with words from the previous lesson. Students have to say which words are verbs, adjectives, which have a positive or negative meaning, and which refer to people or things. The teacher can also copy and paste words for revision to the online flashcard site Study Stack. This site has mobile apps students can download to their smart phones and use at home, on the bus, etc. Divide students into small groups of three or four and ask them to write as many words as possible connected with the topic of the lesson, for example ‘jobs’. Set a time limit of five minutes and remember to give the groups points for every word they think of. It’s a good way to get an idea of what vocabulary they already know before starting the main part of the lesson. Use mind mapping as a pre-reading and post-reading activity. Students work in small groups and they think about the words connected with the topic of a reading text. Then all the groups share their words and, together with the teacher, they create one large mind map on the board. As a post-reading activity, ask each group to add more words and phrases in the reading to the map. Using pictures and flashcards is a great way to present new vocabulary but to appeal to your students’ other senses, try using real objects or even sounds and tastes. For example, if you present the topic of ‘travelling’, bring some maps, postcards, gadgets, etc. and ask your students to name the objects and guess the title of the lesson. Or for the topic of ‘food’, bring some in and have students taste it without looking to see what it is. Choose words you are going to teach and then create a story with them. For example, I recently taught a lesson with the theme ‘bank robbery’ and made up a story. After presenting a story, I prepared a gap-fill text to check students’ understanding of the story. You can also look for a song on the same topic; for example, I used ‘Bankrobber’ by The Clash. I gave each students two pieces of paper with the words from the song – one was correct and the other was not; for example, the two words money and many. Students listen to the song and raise their hands with the word they hear. You can watch the ‘bank robbery’ lesson to see how I used these activities here. After you have taught some idioms, divide your students into groups of 3-4 and give them different idiomatic expressions. 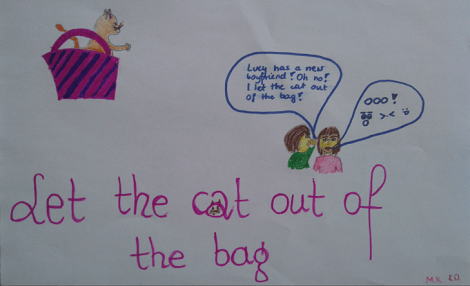 Students draw a picture or prepare a short sketch showing the figurative meaning of the idiom. The other groups have to guess the meaning of the idiom. It is a good idea to demonstrate the activity to your students first, so you can have a picture and a short sketch prepared in advance. As a follow-up activity, students can prepare posters with a literal and figurative meaning of the idiom which will be displayed in the classroom later on. Here is a poster from a group of my students. As a pre-reading activity, divide your students into groups of three and distribute to them a few items of vocabulary from the text you are going to read (each group is given a different set of words or expressions). Their task is to find the meaning, pronunciation and an example sentence using the item. Next, students count one to three in each group and form new groups (so one works with one, two with two, etc.) and they exchange their different sets of words. Students can either use paper dictionaries or, if you allow it, their smartphones or tablets to use online dictionaries and corpus. To make a revision lesson more exciting, prepare different tasks for your students and ask them to walk from station to station and solve them. These could be: matching words with their English definitions or pictures (at lower levels), crosswords, filling in the gaps with given words, word dominoes, etc. You can spice up the revision lesson with a hotel reception bell. When a student completes all the tasks in each station, he or she rings the bell which is placed on the teacher’s desk. To make students practice the new vocabulary in the lesson, provide a problem they have to solve which includes the target vocabulary. The one I used with my students, after the ‘bank robbery’ lesson, was about solving a mystery about the Bank of Minnesota. Students had to discover who robbed the bank. You can see the materials here. Such problem solving activities give students the possibility to practice new vocabulary and develop their speaking skills as well as teaching them cooperation to accomplish the task. In today’s 21st century classroom, digital tools help students to practice new vocabulary, review and play games with content. Some tools allow students to hear pronunciation, read words in authentic context, or create virtual word walls with other classmates. WORDHIPPO – students can check the meaning of the word, its opposite, rhyming words as well as seeing how the word is used in the context. WORDSIFT – a useful tool which allows students to see how words are grouped semantically. All you need to do is to paste or type a piece of text and the program will sort the most used words of the passage, their images and videos based on words. TRACKSTAR – it’s a free online program which allows teachers to create a visual vocabulary field trip for students. Students have the possibility to see the words in different contexts and enrich their vocabulary. 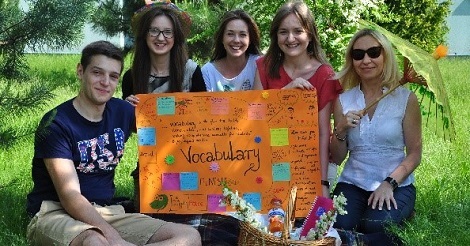 VOCABAHEAD – it’s a very useful tool for English learners. They can view short videos, hear pronunciation, play games as well as take quizzes. Teachers can create their own wordlist for students and embed it into classroom blog or website (such as Edmodo). If you have great teaching ideas you’d like to share, contact ETpedia with your list of 10.